It’s time to plant some fall bulbs. Yep – it’s almost past time even, because you should also be getting your flower beds ready for the winter. But I’ll share how to do that in another post. Around here in northern Utah it’s supposed to snow this weekend. I know – Snow! But first we have to hit 68 degrees today and then it can plummet down to snow temperatures later in the week. So you’d better get busy, because time is running out and if you delay then when spring rolls around and you see other people’s daffodils, tulips and crocus’ blooming while you’re staring at a bare and boring flower bed, you’ll be bummed. Breathe. That was a long sentence. I seem to be getting really good at those lately. I think I just have a lot to say and feel like I need to type it really fast without trying to construct smaller sentences because if I stop to try to figure it out then I’ll forget what I was trying to say in the first place. You need: bulbs, hand shovel, big shovel, garden gloves (optional), plastic knives (I’ll explain later) and a watering can. 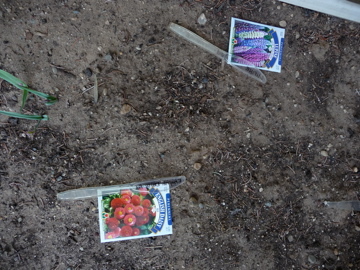 I know this picture shows seeds as well as bulbs, but you don’t want to plant your seeds until the spring. Be patient. Bulbs only, please. You can do this however you want. I know of some people who spray paint the spot where their bulbs and plants will go. Okay. Whatever floats your boat. I don’t think I’m that exact. I just use scrap pieces of paper thrown on the ground. I mean – placed strategically on the ground. Or you can just set your bulb package straight on the ground. That works, too. I’m no expert, but I do know how to plant a bulb. You follow the instructions that came with your bulbs, of course! Many bulbs need to be planted 6″ deep but again, follow the instructions that came with your bulbs. Dig your hole to the desired depth. Place your bulbs in the ground, cover with dirt then water thoroughly. If you’re digging a large area, you’ll probably want to use the big shovel. If it’s a small area, use the hand shovel. As for where to place your bulbs, I’ve read from experts that if you want your garden to look more natural, you should place them in odd groupings. For large areas, you should randomly throw them in your hole then plant them where they land. 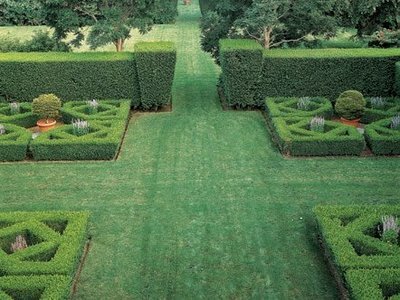 Don’t plant them in a straight line unless you’re going for the extreme structure of an English garden. Oh – and plant them pointy side up. Yes, those are the technical terms. Now for the plastic knives. This is how you mark where you’ve planted your bulbs. Oh sure, you could spend money on fancy markers, but why don’t you spend that money on more bulbs? 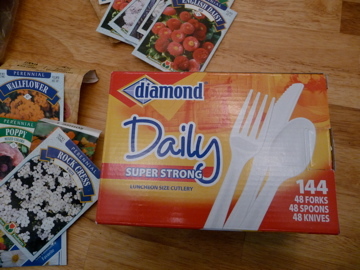 Plastic knives are so cheap. Plus, they’re good conversation starters when people look at your flower beds and ask you what the knives are for. 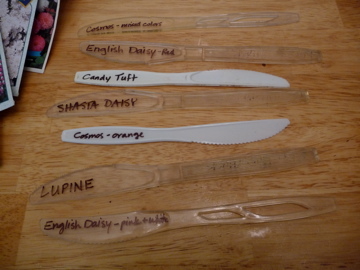 Just take a Sharpie and label your knives with the plant’s name on it. Stick it in the ground and you’re done. You can’t go wrong with plastic knives. And now you’ll have a purty yard in the spring. 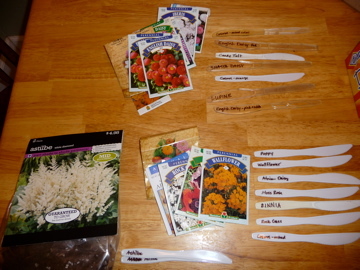 This entry was posted in Gardening, Organizing and tagged bulbs, garden gloves, planting, plastic knives, shovel, snow, spring. Bookmark the permalink. I like the knife idea!